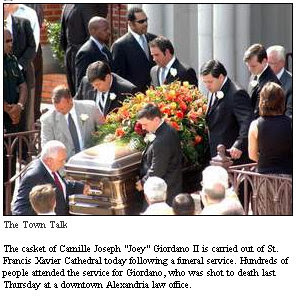 Hundreds of mourners packed St. Francis Xavier Cathedral today to say goodbye to Camille Joseph “Joey” Giordano II, who was killed in last Thursday's shootings at a downtown Alexandria law office. More than 500 people attended today's funeral, which began at 10 a.m.
Giordano, 32, of Alexandria was killed Thursday at his father’s law office in downtown Alexandria by a man whose reasons for the shooting of five people there are unclear. Burial for Giordano is in Greenwood Memorial Park, Pineville, under direction of John Kramer & Son. 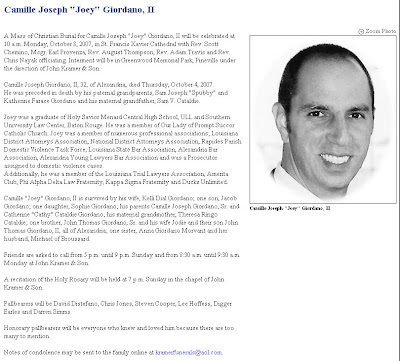 Notes of condolence to the Giordano family may be sent to the family online at kramerfunerals@aol.com.